Galen's major physiological writing, On the Usefulness of the Parts, though written in Greek is usually referred to by its Latin title, De usu partium. It consists of seventeen books (maqalahs) and was translated into Arabic, from a Syriac text now lost, by Hubaysh, the nephew of the translator and physician Ḥunayn ibn Isḥāq, who died in 873 or 877 (260 or 264 H). Hubaysh's Arabic translation was then revised by Ḥunayn himself, who had earlier prepared the Syriac version used by Hubaysh. 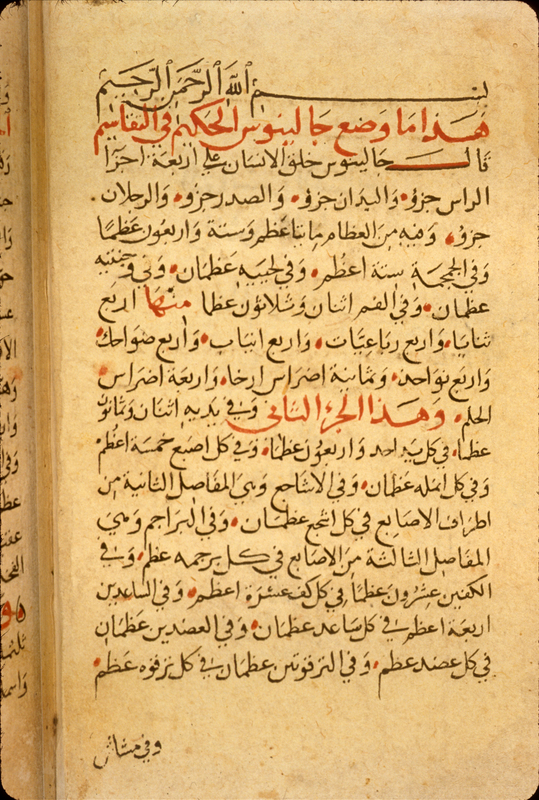 This final Arabic version of De usu partium had great influence in medical literature throughout the Islamic world, from the 9th century through the 17th, from Persia to Spain. Only four other copies of the Arabic translation are known to exist: Escorial (Spain) MS 850, copied in 1145/539H; Paris, Bibliothèque Nationale de France MS arabe 2853 copied in 1283/682H; Manchester, John Rylands MS 809, undated ca. 17th century; and Baghdad, Iraq Museum MS 1378-5, undated ca. 16th century. see Ullmann, Medizin, p. 41 no. 15; Sezgin GAS III, p. 106 no. 40; and Usamah Nasir Naqshabandi, Makhtutat al-tibb wa-al-saydalah wa-al-baytarah fi Maktabat al-Muthaf al-‘Iraqi (Baghdad: Wizarat al-Thaqafah wa-al-I‘lam, 1981) p. 361 no. 702. An edition and English translation of the Arabic version of the sixteenth book (on nerves, veins, and arteries) of De usu partium has been prepared by E. Savage-Smith, Galen on Nerves, Veins and Arteries: A critical edition, edition and translation from the Arabic, with notes, glossary and in introductory essay (Ph.D. diss. University of Wisconsin-Madison, 1969; University Microfilms no. 69-22,480). The manuscript at NLM was not used in this edition since it is lacking the 16th and 17th book. A summary (jawami‘) of Galen's treatise attributed to one Yaḥyá al-Naḥwī is quoted is a passage added at the end of the fourteenth book in the NLM copy (fol. 209a). This synopsis is also quoted in the Paris manuscript. These are the only two references we have to such a summary being made by Yaḥyá al-Naḥwī (John the Grammarian or John Philoponus). 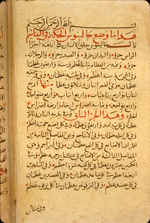 There is a confusion of people known in Arabic as Yaḥyá al-Naḥwī: (1) the 6th-century Aristotelian commentator, John Philoponus, (2) the author of a commentary on De usu partium, who probably was a medical writer living in Alexandria in the late 6th or early 7th century whose Greek commentary on De usu partium was translated into Arabic by Ibn Zur‘ah in the 10th century, and (3) the author of the summary (jawami‘) of De usu partium, who appears to be yet another, later, Arabic-speaking Yahya al-Nahwi. The Greek original of Galen's treatise has been translated into English: Galen, On the Usefulness of the Parts of the Body, trans. M.T. May (Ithaca, NY: Cornell University Press, 1968, 2 vols.). The Greek text has been edited by G. Helmreich, De usu partium libri XVII (Leipzig: Teubner, 1907-9, 2 vols.). see also Gerhard Fichtner, Corpus Galenicum: Verzeichnis der galenischen und pseudogalenischen Schriften (Tübingen: Institut für Geschichte der Medizin, 1985; rev. ed. 1996) p. 19-20 nos. 17 and 18. The end of the fourteenth book of Galen's treatise On the Usefulness of the Parts, followed by a quotation from a summary (jawami‘) of Galen's treatise attributed to one Yaḥyá al-Naḥwī (John the Grammarian, or, John Philoponus). Arabic. 218 leaves. Dimensions 25.2 x 17.8; text area 16.8 x 10.7 cm; 25 lines per page. The title and the author (Jalinus/Galen) are given on fol. 20a and at the end of each section thereafter. The Arabic translator is named on fol. 209a, line 8, as Ḥunayn ibn Isḥāq al-‘Ibādī. The copy is incomplete, beginning in the middle of the first book (maqalah) and stopping in the middle of the fifteenth book. There is a break in the text between fols. 68 and 69; parts of the fifth book and the start of the sixth have been repeated. Breaks also occur between fols. 167 and 168 and between fols. 170 and 171. The manuscript itself is undated, but the appearance of the paper, ink, and handwriting suggests a date of about the 17th century. The text is written in a small, careful, elegant, and professional naskh. The text area has been frame-ruled. Black ink with headings in red. There are catchwords and corrections by the copyist. There are later marginal numerals alonside the section headings, usually with extra paper pasted at the edge to reinforce it. There are only occasional marginalia in later hands, including a talismanic design (partially cut off) at the top of fol. 140b. The glossy beige paper has vertical curved laid lines (often indistinct) but no chain lines. The paper is waterstained and damaged from damp, and fol. 218 is quite brown and soiled. The edges have been trimmed from their original size. The volume is bound in pasteboards covered with purple paper; the spine is leather. The endpapers (blank) are of a different and more recent paper. The front pastedown, of modern graph paper, has penciled notes; the back pastedown is a page from a Persian manuscript consisting of a letter dated 1329 H  and written on a modern lined paper that has been folded several times. The volume was purchased by the National Library of Medicine in 1962 from Dr. Lutfi M. Sa‘di of Detroit (Sa‘di MS. 1). Hamarneh, "NLM", p. 79-80; D.A. Kronick and A.S. Ehrenkreutz, "Arabic medicine, AD 740-1400," Medical Bulletin of the University of Michigan, volume 22 (1956), p. 217-218. 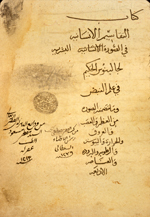 According to early Arabic sources, there were sixteen (or fifteen) Galenic treatises, or groups of treatises, that were considered fundamental to medical teaching in pre-Islamic Alexandria and in the early centuries of Islam. These are often referred to as the Alexandrian "Canon" of Galenic treatises. One of these groups of fundamental writings were four short anatomical treatises that were intended as introductory texts in anatomy. The group comprised a treatise on bones for beginners, one on the anatomy of the muscles, one on the anatomy of the nerves, and one on the anatomy of the veins and arteries. see A.Z. Iskandar, "An Attempted Reconstruction of the Late Alexandrian Medical Curriculum," Medical History, vol. 20 (1976), p. 235-258. The present manuscript is a copy of the treatise on bones for beginners, known in Latin as De ossibus ad tirones. 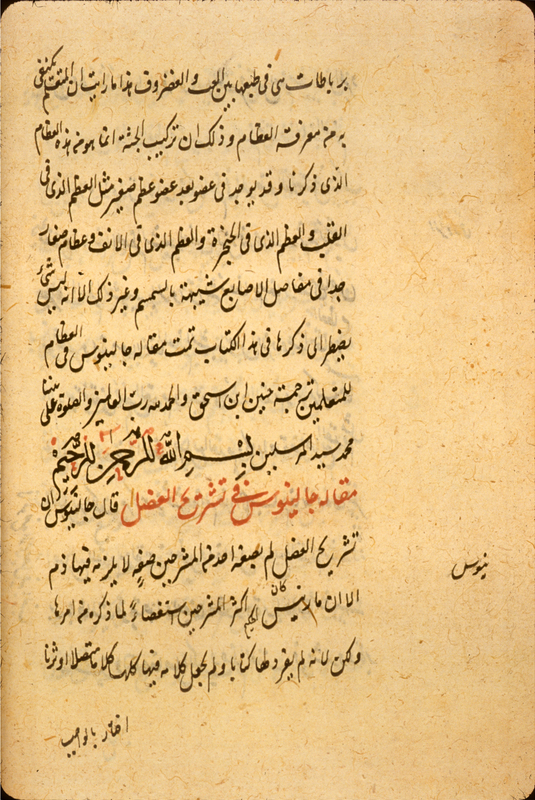 For other copies of the Arabic text, see Sezgin GAS III, p. 83-4 no. 7, and Ullmann, Medizin, p. 40 no. 13. The Arabic translation of the treatise has not been published. The original Greek was edited and translated by M.G. Moore, Galen: Introduction to the Bones (Ph.D. dissertation, University of Michigan, 1969). Earlier English translations from the Greek were made by C.M. Goss and E. Goss Chodkowski, " 'On Bones for Beginners' by Galen of Pergamon: a translation with commentary," American Journal of Anatomy, vol. 169 (1984) p. 61-74, and by C. Singer, "Galen's Elementary Course on Bones," Proceedings of the Royal Society of Medicine, Section on History of Medicine, vol. 45 (1952) p. 767-776. The Greek text was published earlier in C.G. Kuehn, Claudii Galeni opera omnia (20 vols., Leipzig, 1821-1833), vol. 2, p. 732-778. see also Gerhard Fichtner, Corpus Galenicum: Verzeichnis der galenischen und pseudogalenischen Schriften (Tübingen: Institut für Geschichte der Medizin, 1985; rev. ed. 1996), p. 17-18 no. 12. The beginning of the Arabic translation of Galen's treatise On Bones for Beginners. Arabic. 27 folios (fol. 62b, line 4 to 88b, line 7). Dimensions 19 x 12.2 cm; text area 12 x 6.3 cm; 12 lines per page. The title and author are given in the colophon on fol. 88b, lines 6-7, with a shorter title (Kitāb Jalinus fī tashrīḥ al-‘izām, "Book of Galen on the Anatomy of the Bones") given on fol. 62b, lines 7-8. The translator is named by Ḥunayn ibn Isḥāq on fol. 62b. The manuscript is undated, but the appearance of the paper, ink, and handwriting suggests a dating of the early 18th century. This item in the volume was copied by the same unnamed copyist who transcribed the previous Persian item and the subsequent three items in the volume. The text is written in a medium-small, careful and professional naskh with some ta‘liq characteristics. The text area has been frame-ruled, with some final letters of words at the end of the lines written in the margins. Black ink with headings in black and in red. There are catchwords and some scribal corrections, with a few later marginal annotations and corrections. The very glossy beige paper has occasional thin patches and indistinct wavy horizontal laid lines, but no chain lines. The same paper was used throughout the volume. There is waterstaining on the three open sides of all the leaves. The edges or corner of a number of leaves have been repaired. There has been some earlier numbering of some folios in pencilled Western numerals, but they are badly out of sequence with the recent foliation. The volume consists of 118 leaves. Item 1 (fols. 1a-19b) is an anonymous and untitled tabular treatise on foods (MS P 26, item 1), and item 2 (fols. 20a-62b) on food and drink, untitled, by Vaṭvāṭ (MS P 26, item 2). Item 3 (fols. 62b-88b) is the Maqālat fī al-‘izām lil-muta‘allimīn by Galen is here catalogued and item 4 (fols. 88b-109a) the Maqālat fī tashrīḥ al-‘aḍal also by Galen (MS P 26, item 4). Item 5 (fols. 109b-113a) contains compound remedies, anonymous and untitled (MS P 26, item 5), and item 6 (fols. 113a-118b) is an anonymous and untitled tract on sexual hygiene (MS P 26, item 6). The volume is bound in modern binding of brown leather over pasteboards. There are modern paper pastedowns and endpapers. The volume was purchased in 1941 by the Army Medical Library from A.S. Yahuda (ELS 2375). Schullian/Sommer, Cat. of incun. & MSS., entry P26, p. 338. 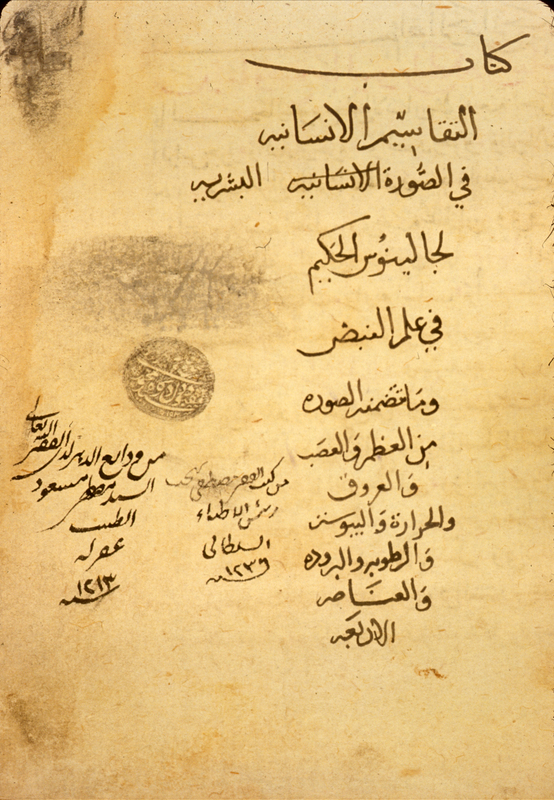 According to early Arabic sources, there were sixteen (or fifteen) Galenic treatises, or groups of treatises, that were considered fundamental to medical teaching in pre-Islamic Alexandria and in the early centuries of Islam. These are often referred to the the Alexandrian "Canon" of Galenic treatises. One of these groups of fundamental writings were four short anatomical treatises that were intended as introduction texts in anatomy. The group comprised a treatise on bones for beginners, one on the anatomy of the muscles, one on the anatomy of the nerves, and one on the anatomy of the veins and arteries. see A.Z. Iskandar, "An Attempted Reconstruction of the Late Alexandrian Medical Curriculum," Medical History, volume 20 (1976), p. 235-258. The present manuscript is a copy of the treatise on the anatomy of the muscles, known in Latin as De musculorum dissectione or De musculorum dissectione ad tirones. For other copies, see Sezgin GAS III, p. 84-5 no. 8, and Ullmann, Medizin, p. 40 no. 13. The Arabic translation has not been published. The original Greek text was published earlier in C.G. Kuehn, Claudii Galeni opera omnia (20 vols., Leipzig, 1821-1833), vol. 18, p. 926-1026. see also Gerhard Fichtner, Corpus Galenicum: Verzeichnis der galenischen und pseudogalenischen Schriften (Tübingen: Institut für Geschichte der Medizin, 1985; rev. ed. 1996), p. 17-18 no. 112. The Greek version was translated into English by C.M. Goss, "On the anatomy of muscles for beginners by Galen of Pergamon", Anatomical Record, vol. 143 (1963) p. 477-501. The beginning of the Arabic translation of Galen's treatise On Muscles for Beginners. Arabic. 22 folios (fol. 88b, line 8 to fol.109a). Dimensions 19 x 12.2 cm; text area 12 x 6.3 cm; 12 lines per page. The title and author are given at the beginning of the text on fol. 88b. The manuscript is undated, but the appearance of the paper, ink, and handwriting suggests a dating of the early 18th century. This item in the volume was copied by the same unnamed copyist who transcribed the second item in the volume, a Persian medical treatise, and the preceding Arabic treatise, which is a copy of Galen's treatise on the anatomy of the bones for beginniners. The volume consists of 118 leaves. Item 1 (fols. 1a-19b) is an anonymous and untitled tabular treatise on foods (MS P 26, item 1), and item 2 (fols. 20a-62b) on food and drink, untitled, by Vaṭvāṭ (MS P 26, item 2). Item 3 (fols. 62b-88b) is the Maqālat fī al-‘izām lil-muta‘allimīn by Galen (MS P 26, item 3), and item 4 (fols. 88b-109a) the Maqālat fī tashrīḥ al-‘aḍal also by Galen here catalogued. Item 5 (fols. 109b-113a) contains compound remedies, anonymous and untitled (MS P 26, item 5), and item 6 (fols. 113a-118b) is an anonymous and untitled tract on sexual hygiene (MS P 26, item 6). This treatise is a loosely organized assemblage of material on the structure of the human body and prognostics said to be by Galen. The manuscript at NLM appears to be the only preserved copy. It opens with the statement that the constitution (khalq) of the human body consists of four divisions: the head, the hands, the abdomen and the legs. There follows an enumeration of the number of bones in each of these divisions and then the number of blood vessels in each, followed by a general discussion of the nature and propeties of the constitution (khalq) of some internal organs, such as the brain, liver, kidney, and spleen. Intermingled with this material is a section on palpitation (majissah) of the arteries (fol. 8b-9b) and a section (fol. 12a-13a) in which it is asserted that Plato the philosopher (Aflatun al-filasuf) maintained that the human body is divided into four aspects (taba'i‘): the head, the chest, the belly, and the genitalia. On fol. 13a (line 10), the subject changes abruptly with a title, written in larger script, Hikayat min akhbar al-salihin (Stories from Reports of Predecessors) followed by three anecdotes. The first concerns Hippocrates speaking to Musá [otherwise unidentified; possibly referring to Moses]; the second concerns a question addressed to Socrates by one (unnamed) of his students; and the third concerns a conversation between two of the Orthodox caliphs, Abū Bakr and ‘Alī ibn Abī Talib. This section ends (fol. 13b line 8) with the statement that Hippocrates and Socrates are numbered amongst the Greeks, and that Plato was a descendent (hafidh) of Idris. Immediately following this anedoctal interlude is a short discourse on the examination of urine, with the title Qala fī sifat al-bawl (He Said Concerning the Property of Urine). Not only is the section of anecdotes clearly not by Galen, but the other parts of the treatise do not correspond with any Greek treatise known to be by Galen. The compilation is quite certainly a spurious attribution, though it may draw upon some Galenic and pseudo-Galenic material. 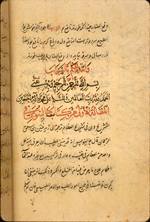 The manuscript was owned in the 19th-century by the translator into Turkish of the Canon on Medicine by Avicenna and head physician of the Ottoman Empire, Mustafa Behcet. 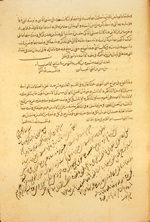 The title page, having an owner's note written in 1820-1 (1236 H.) by Mustafa Behcet, the Chief of Physicians in Istanbul and the translator into Turkish of the Canon on Medicine by Ibn Sīnā (Avicenna). There is also a circular owner's stamp, two defaced owners' signatures, with a fourth owner's inscription in the lower left corner dated 1213 H (1798-9 AD) and signed Muṣṭafá Mas‘ūd the physician. 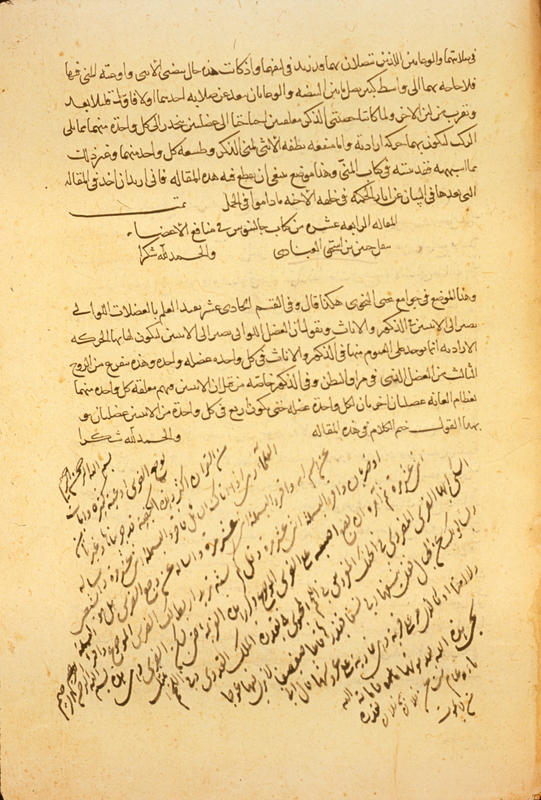 The beginning of unique copy of a treatise on anatomy and prognostics, Kitāb Taqāsīm al-insānīyah fī al-ṣūrah al-basharīyah, attributed to Galen. Arabic. 14 folios (fol. 1a-14b). Dimensions 17.0 x 12.7; text area 11.8 x 7.8 cm; 17 lines per page. The title is given on the title page, fol. 1a while the beginning of the treatise (fol. 1b) reads "This is what Galen the doctor said about the classification (al-taqasim)". The author's name is given as Jalinus al-hakim (Galen the doctor) on the title page and on fol. 1b line 2. The manuscript itself is undated, but the appearance of the paper, ink, and handwriting suggests a date of the 15th century. The text is written in a medium-small, careful, consistent, naskh script with occasional vocalization. The text area has been frame-ruled, and occasionally the final letters of words at the end of lines are written in the margins. A dense black ink with headings in red. There is some red shading of black headings, and there are some red overlinings and red-dot text stops. There are catchwords and a few marginal corrections. The lightly-glossed yellow-beige paper has chain lines in groups of 3's (indistinct on many leaves). The paper is waterstained, slightly wormeaten, and soiled through thumbing. Fol. 9 has repaired patches and fol. 11a has been defaced with pen practices. The volume consists of 17 leaves and one preliminary leaf of a different paper. Fol. 15a-b is filled with casually-written prayers and pious inscriptions added by a later reader. Fols. 16a-b and 17a are blank. Fol. 17b is blank except for a note in Arabic stating that it is a book by Jalinus. The preliminary folio has some pencilled Turkish notes, some doodling by a reader, and the Arabic numeral 606 written in blue ink. No other copy appears to be recorded. The beginning, however, is similar to (though not identical with) a manuscript attributed to Galen and titled Risala fi khalq al-insan (Istanbul, Topkapi Saray, Ahmed III MS. 1461, fols. 138a-141a); see GAS III, p. 129 no. 107 and p. 412. The volume is bound in a red leather modern library binding with envelope flap. There are modern pastedowns and endpapers. 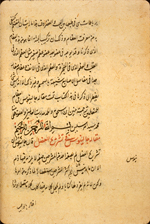 The volume was owned by Muṣṭafá Behcet, Royal Chief of Physicians (al-ra'is al-atibba' al-sultani) in Istanbul and the translator into Turkish of the Canon on Medicine by Avicenna. His signature, with the date 1236H [=1820-1 AD], occurs on the title page, fol. 1a. On the preliminary fol. b, which is otherwise blank, there is a pencilled note in a recent hand repeating the information in the owner's signature and adding the information that he was the translator (mutarjim) of the Canon of Avicenna. 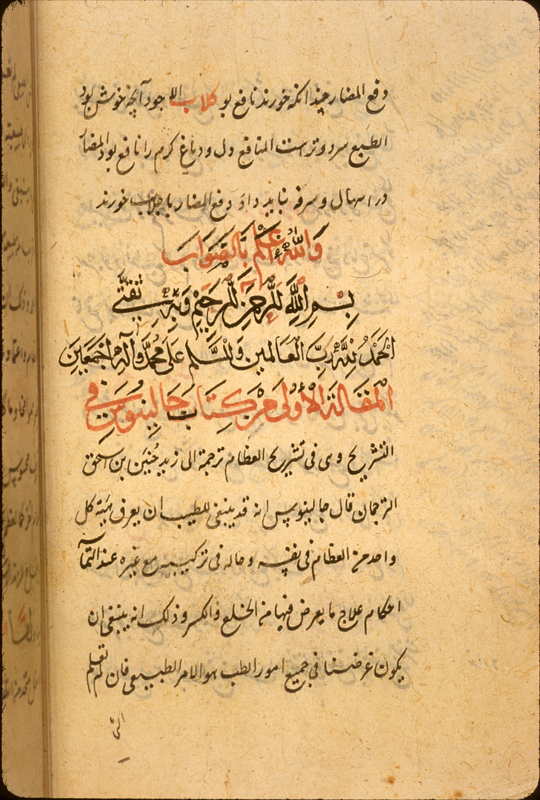 Another owner, Muṣṭafá Mas‘ūd al-tabib (the physician), also inscribed a note dated 1213 H (1798-9) on the title page (fol. 1a). He is likely to be the Muṣṭafá Mesud Efendi whose tombstone, dated 1236 H [1820 AD] is preserved today in Istanbul; see Tip Tarihi Arastirmalari, 1988 volume 2, p. 120. The title page also has a circular owner's stamp and two defaced areas where one there were additional owners' signatures. The volume was purchased in 1941 by the Army Medical Library from A.S. Yahuda, who acquired it in Istanbul (ELS 1751 Med. 90). Schullian/Sommer, Cat. in incun. & MSS., p. 321-2 entry A74; Hamarneh "NLM", p. 81; Ullmann, Medizin, p. 56 no. 86; Sezgin GAS III, p. 412.